Indian mythological and historical literature, written over the course of well over three to four thousand years, contains a number of fairly detailed references to and descriptions of non-human, “semi-divine” living beings and of various visible and invisible realms which in some cases appear to be located in other dimensions of reality or in parallel universes. There are also accounts and reports of aircraft and space faring vehicles, as well as of very powerful weapons of war capable of bringing about massive destruction over very large areas. Those vehicles and tools are used by both deities and human beings according to those stories. On the other hand, contemporary scientific evidence and official conclusions in various countries point out that extremely advanced spacecraft and humanoid but seemingly non-human (probably “trans-dimensional”) beings are active on our planet and in outer space. This paper establishes a connection between those separate findings and suggests that an updated and expanded vision of the structure of the universe is required as the present, classical cosmology is inadequate to account for many observations. Myths and legends are not accepted as factually real according to the methods, criteria and notions of science. They are regarded either as imaginary stories designed to provide ritual and moral teachings as well as cultural entertainment to society; or as fictionalized and symbolic accounts of ancient events, whose original character and circumstances were partly forgotten. The Euhemerist school of thought (named after the 4th century Greek mythographer Euhemerus, in line with the Skeptic approach of the Cyrenian philosophers) regards gods and super-natural beings as latter-day depictions of historical human figures who were, in the course of centuries or millennia, invested with divine or heroic supra-human attributes. Though there is evidence that those socio-historical interpretations are justified in many if not all cases, there is also ground for considering another way of reading those stories, without prejudice to the previously described exegeses. That would be the open-minded, objective method which looks at the descriptions and events reported in mythology and sees how they might relate to current or recent events for which we have scientifically admissible proof. Erich von Daniken is perhaps the best known researcher and author to have carried out this task though inevitably, many of his interpretations, which are so bold as to be on the outer fringe of speculation, have been met by controversy and often outright dismissal among mainstream scholars. Given that myths and legends are known to be legible at various levels, from the literal to the psychological and metaphysical, not to forget the historical dimension, we will not be doing a disservice to this ancient lore by accepting it in principle, as a bona fide account of actual happenings even though obviously, literary embellishments and inevitable inaccuracies were inserted in the course of time. What are the factors that make it worthwhile and even necessary to take this factual, unprejudiced view? Firstly, the Indian traditional systems of cosmogony, metaphysics and cosmology took shape over many centuries, if not millennia and were held to be factual and accurate in several civilizations within the greater Indian area of influence. They are still respected and influential in the country, adjoining areas and increasingly, in regions of the world where various aspects of Hindu-Buddhist culture such as yoga and religious practices are becoming known and followed. On the other hand recent scientific discoveries tend to support some of the conclusions and observations recorded in many of the Indian philosophical and technical texts. Secondly, many repeatedly observed and scientifically confirmed phenomena do not find a satisfactory explanation according to the current scientific principles and theories while they are accounted for in the traditional Indian cosmology. Therefore, it may be useful or even necessary to revisit the cosmos depicted by the Vedic and Puranic texts in order to make sense of some enigmatic aspects of the universal reality that confronts us. “Modern” science evolved under the influence of materialistic rationality which drew its principles partly from Medieval Theologian William of Occam’s “razor”. An effect of that attitude is that (western) scientific astronomy for one started from the lowest common denominator in terms of its assumptions about space and time and initially discarded the ancient Indian chronologies which were it regarded as outlandishly implausible, especially when compared with the Hebrew Biblical records that placed the creation of the Universe a mere six millennia ago (4004 BC). In the nineteenth century, astronomers were still very timid in their cosmological estimates and only a few visionaries like astronomer Camille Flammarion dared to depict the universe as being possibly infinite or at least inconceivably large. 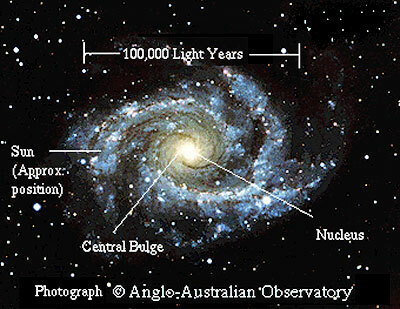 Only reluctantly did his successors admit that the Milky Way was a galaxy containing billions of stars and it took even longer to realize that it was just one of a huge number of similar or larger galaxies. Time scales did not expand easily either in the minds of scientists. …of Indian Scriptures, encompassing trillions of solar years remained practically beyond their intellectual grasp until the advances made in telescopy and astrophysical observation in the first half of the twentieth century gradually reconciled them with the fact that the universe is not only larger than we imagine but also possibly larger than we can imagine or measure. In the light of science the Biblical record about the cosmos being made in six days by God a few thousand years ago appears comparatively primitive and, contrary to the theory of linear human progress, ancient civilizations founded on cosmological myths similar to those of India, China, Africa or the Americas may be said to have regressed intellectually when they adopted the “science” that came together with christianity. There is evidence that many of the texts compiled and assembled in the Torah or Old Testament are derived from much older sources and held a symbolic meaning which was mostly lost when a literal interpretation was promoted. The estimates provided by contemporary astronomy for the age and size of the cosmos and of its galaxies and stars are now broadly congruent with the numbers found in Indian scriptures. On the other hand the theories of creation and matter expounded in them are still outside the pale of the current scientific worldview which describes them as “mystical visions” or unproven speculations though it cannot actually disprove them. Yet the fact that some “mythological” annals are uncannily accurate or at least plausible in their mathematical evaluations should prompt physicists to take a closer look at the “Indic” descriptions of the structure of reality. It can be said in a few lines that the various schools of Hindu, Buddhist and Jain physics teach that there are several parallel fields of reality within our universe, made up of different substances; or, more accurately, of the same substance at different density levels. The underlying stuff, from where all originates, is undefinable, but is generally called Brahman or Prakrti, that can be defined as the original ground of consciousness. We may detect it in what contemporary astrophysics calls the dark matter of the cosmos which seems to make up some 96% of the total. From that initial substrate a number of realms emerge, first the causal (karana), then the subtle (suksma) and finally the physical or gross (sthula) field of matter, made up of the combinations of the five basic elements – actually “states of the energy field” that we define as ether, fire, air, water and earth – in varying degrees. Those “concentric” spheres may be regarded as geographic locations situated above or below the surface of Earth or even as physical continents; but these names generally seem to other levels of existence, not topographically removed from ours, but parallel to it, deployed in extra-sensory dimensions that exist beyond the three and half we live in (with time as a half-dimension since we cannot physically reverse it at our level of reality). Some Buddhist Scriptures, based on the same cosmological system, refer to countless worlds that compose the “chiliocosms” or galaxies spread throughout space. Man is said to have come into the flesh in this world (the kamadhatu or realm of desire) from the higher sphere of the Abhasvara devas (pure light gods). All those planes many of which are invisible and imperceptible to “ordinary humans” are held to be as thriving with life as our own. They contain their own elements, plants and animals, including some similar in shape and behavior to humans. The parallel worlds are in constant contact with ours because, unlike us, most of their denizens are aware of our existence, can observe us and indeed intrude into our space-time, usually “below the radar” of our conscious awareness. Naturally, especially as long as they remain in their respective spheres, they escape all criteria of scientific detection since the latter are formulated on the assumption that only perceptible and quantifiable creation exists. However, certain humans can also accede to those other worlds, either due to special gifts and powers or through intensive psychic and spiritual training or magical practices but they thereby automatically violate the rules of the scientific game, set in the age of Enlightenment, so that their experiences are ignored as being invalid by definition. Revealingly, the criteria of proof that are generally upheld by scientific methodology are not deemed sufficient in cases which violate the laws of nature as defined by “science”. Non potest sicut non est: it can’t be, therefore it is not, or in a milder version “extraordinary claims require extraordinary proof”. 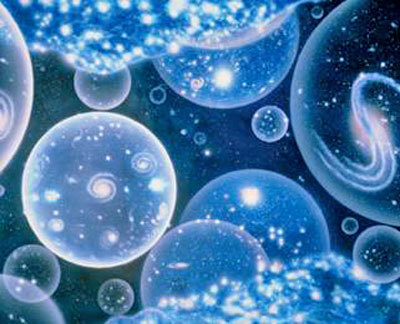 The spatial map of the cosmos we have just outlined is reflected in a chronological order that we have already alluded. Each cycle of life is said to be divided into four ages of decreasing duration and virtue: the Satya or Kriti, Treta, Dwapara and Kali yugas. As Creation drifts or outflows farther away from its source, its purity decreases and its light wanes. The actual duration of the yugas, which it interpreted diversely depending upon the sources being consulted, is less important than the notion that as the age declines, spiritual power fades and technology becomes increasingly prevalent and sophisticated. Since we are in the age of Kali that we entered more than five thousand years ago, our spiritual and psychic faculties are said to have dwindled to a mere shadow of their original power, we are witnessing the rise of advanced technologies that enable us to venture always deeper into outer space and visit other planetary bodies. The Puranic scriptures say that while in the Satya Yuga, humans had all the gifts that we now regard as supernatural. In the Treta Yuga they had to use mantras (or verbal formulas) to access those powers, or control their Vimanas (flying vehicles) and also their weapons (astras and shastras) because war had become a fact of life then. In the Dvapara Yuga, they needed yantras (magical signs and drawings). Science and technology are mentioned and even described but they are regarded as crutches built by degenerating mankind in order to make up for the loss of natural faculties. In the Kali Yuga, predictably machines (kritakas) must be built and operated with metals and other material substances and propelled by physical energy generated by burning or otherwise harnessing material substances. Mantras, Tantras and Yantras do still exist, although many were reportedly lost, but since their power lies at the invisible or at least mathematically unquantifiable levels of spiritual and psychic existence, they are not deemed relevant by our technocratic and intellectual leaderships. The power of our technologies is hence, paradoxically, rooted in our limitations as a species which is described as being a shadow of its glorious original self. After reporting uncritically what is alleged in those scriptures, we may point out that similar accounts of evolution are found in many other sacred and ancient texts throughout the world. There is a hoary, quasi-universal tradition behind the belief that modern mankind is the descending incarnation of much higher life forms, not the result of a long and gradual linear progression as the modernTheory of Evolution (TOE) holds. Other major implications of the Indian traditional history of the world are that the material means for conveying knowledge and for record keeping, such as writing and, more recently, taping or filming were not needed in earlier times since oral or telepathic communication and memorization were far superior methods for the acquisition and preservation of information and above all wisdom. Thus the progress made in those areas does not denote a rise from barbarity to true humanity but constitutes instead an imperfect substitute for the lost powers and abilities of our remote ancestors or predecessors on this planet. The extraordinary quality and depth of the remaining Vedic texts, apparently consigned to memory in an oral form for untold centuries, seem to confirm the refinement and elevation of the civilization which preserved them with flawless precision down to our days. 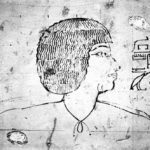 The contention that they originated in a highly evolved culture endowed with now lost spiritual and cognitive techniques is hence plausible and it finds an echo in Plato’s doctrine who describes the invention of writing as an effect of the loss of primeval wisdom. 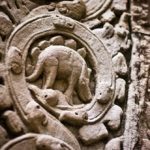 Contrary to modern humans, the other creatures described throughout Indian ancient and medieval literature, have not declined but remained in their original condition, with all the powers and attributes assigned to them. Although they may have made themselves more discreet, perhaps simply because our growing physical “density” has robbed us of most of our extra-sensorial means of perception. As said earlier, the materialistic, skeptical or agnostic mindset that Western societies have exported all over the planet in the last two or three centuries has played a major role in deporting all traditional lore to the “no man’s land” of primitive legends or ethnic fiction. However since the origins, Indian texts record that human beings mixed and mingled with the various gods, genii and “demons” (in the greek, ambiguous or “good” sense of the term) and often inter-married with them, giving birth to hybrid beings. Some highly meritorious and gifted men and women became gods and rose into the higher heavens while others were semi-demonic and moved freely between various worlds. Certain super-natural creatures are said to descend from apparently human ancestors, like the rakshasas who were begotten by the great Vedic Rishi Pulastya. The latter is identified as one of the stars in the Big Dipper constellation (Pheida in modern astronomy) and hence his own nature is both earthly and celestial, as are the other six demiurgic rishis of Indian cosmology. The Dipper or Great Bear points to the North Pole or cosmic axis where Vedic cosmology locates the holy Meru mountain, the home of the gods. There lies the origin of the famed “Indo-Aryan” arctic symbolism adopted in certain esoteric circles of 19th and early 20th century Europe. The sciences of yoga and tantra are known to give their advanced practitioners the ability to explore other dimensions and to dwell at least temporarily in them, depending upon the level of mastery achieved in the techniques. Thus, those parallel universes may be closed to most ordinary humans but are not so mysterious to those who know the teachings of the seers. Though not all of them are described precisely, there are enough references to them in the Vedic and Puranic texts as well as in the Ramayana, Mahabharata and in later texts to form a fairly complete image of what they represent. 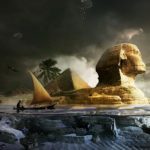 Many scholars have concluded that those apparently super-natural creatures are in fact totemic characterizations of various tribal populations and foreign nations but, aside from that naturalistic interpretation, we should also look at the possibility that they are or were in fact really in existence, as many current observations might well confirm. The pitris are among the closest to living humans. Like the greek Manes they are the souls of the dead ancestors and they inhabit the astral dimension. Pisachas and Bhutas are akin to the ghosts or spirits of western lore and sometimes have the characteristics of goblins. Yakshas are usually protective village spirits and often act as guardian deities of underground treasures, groves or springs. Their monarch Kubera, who also rules over the gandharvas is the god of wealth and metal and he is the “emperor” of the Northern or polar quarter. The yaksha kingdom, said to lie around Mount Kailasa in the Western Himalayas, is called Alaka and is rich in gold. In that same region are the Garudas, mythical eagle-men or flying humanoids, said to have white faces, golden bodies and large red wings, who hail from Hiranmaya and who are rather similar to the Suparnas, also human faced and winged. 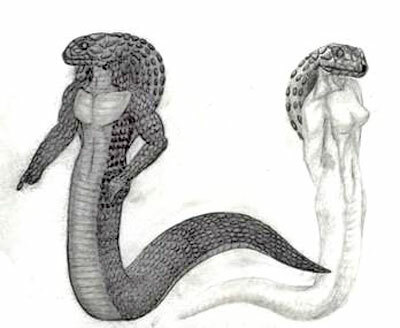 The Nagas, often situated in the same broad region – and whose subterranean abode (the Patala) is said in Tibet to be reachable through a secret opening located under the homonymous temple-palace of Lhasa (the Potala) – are described as serpents or dragons but can assume human forms and like several of those fabulous beings are in fact “shape-shifters”, if we choose to borrow a term of contemporary science-fiction. The Gandharvas, at once warriors and musicians serve the devas and are divided into twenty seven tribes, many of which reside in the enchanted gardens of Chitraratha, north of Kailash. They are also aerial beings whose ancestor or ruler is said to be the great musician rishi Narada. If the Apsaras evoke both the Naiads, Nereids and Valkyries to the western imagination by their appearance and connection with water and heaven, the kimpurusas are lion-faced anthropomorphic creatures and the kinnaras are horse-headed like Hayagriva, the Hindu and Buddhist “demonic” icon who is often called their leader. They have a clear etymological link with the greek Centaurs (kentauri). Their consorts, the kinnaris, however are half-bird, half -woman. The ganas are dwarfish, often misshapen beings who are associated with underground minerals and secrets, like their Western equivalents (leprechauns or goblins) and their name relates them to the Arab Jinns, said to be “made of pure fire without smoke” (astral light, possibly). On a higher plane are the higher “gods”, the Rudras, Maruts, Adityas and Vasus who dwell in subtler realms. Significantly one of the Adityas (children of Aditi: infinite space) is Tvastr, the architect and builder of the universe and the carpenter of the flying vehicles that carry the gods across heaven. Among the Asuras, the powerful rivals of the “shining ones”, is Maya (“the maker”), another cosmic demiurge who crafted the Pushpaka Vimana, described in the Ramayana as the flying chariot of Kubera “resembling a bright cloud in the sky”, taken from him by his envious and ambitious brother Ravana, king of the Rakshasas of Lanka. The rakshasas are also super-human beings who have all sorts of magical and prodigious powers. Their name comes from the root raksh: to protect, indicating that, although they are regarded as generally cruel and destructive forces in classical Hinduism, (though capable of “redemption”) originally they were ambivalent as are most other kinds of divine or supra-human beings. Even more enigmatic are the vidyadharas (holders of wisdom), semi-divine beings, often located in remote Himalayan regions and described as possessors of many fantastic abilities like flying, changing shape and becoming invisible. They are sometimes cited as attendants of Rudra Shiva, the Cosmic Mountain Lord who is “The Destroyer of worlds”. Their monarch is Kandarpabali, according to the Hitopadesha and they are the guardians of tantric wisdom and “supernatural” science. 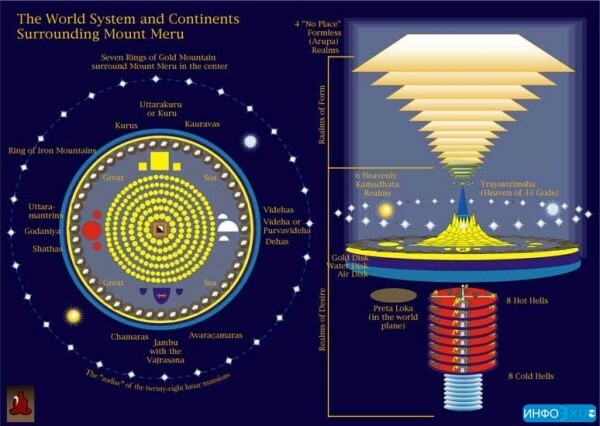 Many of those beings are indeed associated with the great mountain ranges which border India on the North and surround the polar Meru according traditional geography. While many scholars interpret this nomenclature as describing, in a mythological garb, to tribal populations and kingdoms located in the upper Himalayas and on the Tibetan high plateaux, others tend to see them as imaginary creatures with which poetic fantasy populated the inaccessible snowy fastnesses that lay on the horizon. However one can also consider the possibility that there may have been groups of beings “descended from above” or from their boreal abode on those highlands, as the original and pre-Buddhist shamanistic tradition of the Bon religion of Tibet records. The Bon books trace their origins to Dropa Shenrab Miwoche who, more than 18,000 years ago came from the hidden realm of Shambhala flying on the Tagzig Olmo Lug Rig (space) and taught the original form of the Vedic religion handed down to him by his own teacher Shelha or Shiwa Okar (perhaps the Indian Shiva). 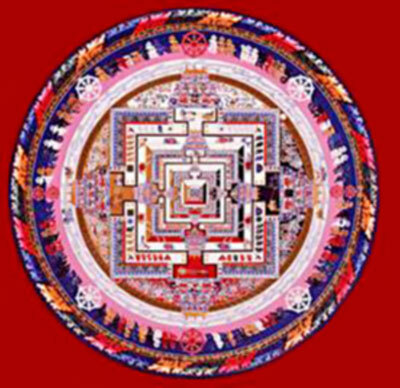 The Bon myth about the initial source of all wisdom seems to have inspired the Buddhist doctrine of the hidden Kings (or Kulikas) of Shambhala who have their seat in the wondrous city of Kalapa where they preside over the secret rite of the Wheel of Time (Kalachakra). In all there will be thirty-two lords of Shambhala, each one ruling for one century, from the first, Suchandra (Dawa Sangpo in Tibetan) to the final one, Raudra Chakrin or Trakpo Cholkhorchen who will come in the twenty-fourth century of the common era, with the contemporary one being Aniruddha or Nagakpo, the 21st in the line. In the Tarim basin of Chinese Turkestan and outlying areas as well as in Mongolia, there are many related legends about Shambhala and Agartha and some intriguing archeological remains have been found (dropa stones and mummies at Baian Kara Ula), leading Chinese archeologists to speculate about “out of this world” origins. It is in that broad region that Taoist cosmology situates the Hsi Tien, the Western Paradise of the Lady of the golden plums of immortality Hsi Wang Mu. It is said to be the Central Asian Holy Land of Belovodye described by the Orthodox Old Believers, Raskolniki. The French esoteric philosopher Saint Yves d’Alveydre in his various books, particularly in his Mission de l’Inde en Europe, written in 1886 under the inspiration of certain Hindu spiritual teachers, claimed to have visited Agartha in his astral body ten years earlier and to have been initiated to his sacred language, called Vatan. “the highest land” in Samskrt, (the name from which paradise is derived, according to him). He hints that this realm is partly subterranean, beneath the Himalayas and at least partly hidden in another dimension, which makes it invisible and inaccessible to most people who are not invited into it. Saint Yves gives several other details on this mysterious empire whose population he evaluates at about twenty million. He adds that it is surrounded by various tributary kingdoms, ruled by their respective Rajas and that this confederacy numbers forty million people in all. The ruling hierarchy consists, in ascending order of yogis, pandits, bhagwandases (who are 360) and above them, of twelve world gurus, headed by the supreme triumvirate of the Brihatma (depository of the spiritual authority), the Mahatma (entrusted with juridical power) and the Mahanga who is the executive enforcer. Saint Yves who was socially prominent and enjoyed great respect in esoteric circles, was so confident of the knowledge he had gained about Agartha that he wrote letters to the Pope, Queen-Empress Victoria and Tzar Alexander III of Russia to offer his introduction to the governors of that hidden kingdom in order to allow the Mahatma and his court to come out in the open and make available the stupendous treasury of knowledge accumulated in the great underground libraries kept by the scholars of Agartha all over the planet. He wrote that all the records of times past since the dawn of the ages and scientific knowledge immeasurably more advanced than that of his contemporaries, was available in those archives, compiled in the last fifty five thousand years since the days of Manu. He cited the 18th century Swedish mystical theologian and polymath Emmanuel Swedenborg, who had described seeing through his extrasensorial faculties the annals of forgotten human history from the origins, buried deep beneath the steppes of Central Asia. The tradition recorded by Saint Yves influenced a number of later esoteric researchers, such as Rene Guenon and Ferdinand Ossendowski as well as Nicholas Roerich. All wrote about or sought the abode of the “king of the world” somewhere between the Himalayas and Mongolia. D’Alveydre indicates that the denizens and rulers of Paradesa are human, though they exist at a very advanced stage of evolution which lends them the attributes of divinity; but he notes that in the course of their investigations of the universe, both beneath the earth surface and into “the highest heavens”, the Agarthans have discovered various intelligent species, some of which are similar to humans while others seem to be hybrids of men and various types of animals. 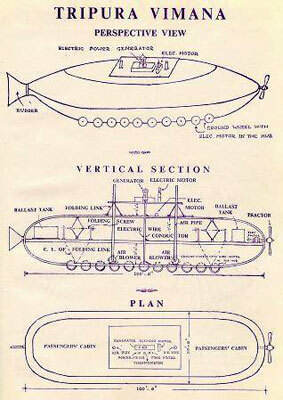 He further says that they use “dirigibles” (zeppelins) to explore the sky and the regions above but that could be an allusion to spacecraft of a type unknown to him who, in his age, could only understand the principle of aerostats since the principle of “heavier than air” aircraft was regarded as unrealistic by most. Also linked to the lore of Agartha are the legends of the underground sacred cities of Shonshe and Shangwa in Eastern Turkestan, refuges of the ancient celestial Uyghur race which is believed to have left the visible world after a great cataclysm many thousands of years ago. In the Mahabharata the abode of the Devas is given as Uttara Kurus, North of Tibet and of the kingdom of the gandharvas (generally equated with modern Afghanistan and Central Asia). It may be the Samskrt version of Homer’s Hyperborea. As we have seen, some of the fantastic creatures alluded to in the previous chapter, whether fully “divine” or at least half-human are said to fly in heavenly chariots and to hold extraordinarily powerful weapons as well having the ability to carry out many magical actions, such as changing shapes, increasing their sizes to colossal proportions or inversely, shrinking to the scale of a gnat or an atom and so on. Such abilities are however also accessible to the greatest yogis so that there is no clear separation between humans and other living beings. The weapons of the immortals, which are gifts of the gods or acquired through a combination of technical knowledge and extraordinary penance and mental concentration (tapas) have practically infinite capabilities, as demonstrated through many Puranas as well as in the course of the great epics. The Sudarshan chakra (or fiery wheel) of Vishnu is irresistibly destructive but can only be used once because on second launch it boomerangs and can annihilate he who shoots it as well as his troop. It is an “intelligent” missile as the name sudarshan (all seeing) indicates and that feature irresistibly brings to mind the celestial wheel “covered with eyes” described by Ezechiel in his Biblical Prophecy. The kaumodaki is Visnu’s mace whose effects are also devastating and irresistible. The Indravajra is a beam of searing light, a “laser” thunderbolt which is directed and shot through a circular shield acting as a sort of reflector. Finally the Narayanastra, the Pashupatastra and above all the Brahmastra are so lethal that they extinguish all life in the area in which they are unleashed and cause long-term and fatal damage to the ecosystem. There is no need to remark that many of the features and effects of those mythical weapons are very similar to the capabilities of the ballistic, chemical, meteorological, electromagnetic and nuclear arms that have been developed by the most advanced military powers or are envisioned by strategic planners and scientists for the future. Though the stock response of academics is that such descriptions merely reflect the breathless imagination of the ancient bards, the abundance of uncannily technical allusions appears to indicate the transmission of a very old experiential knowledge. For instance, in the Mahabharata, Krishna, when his opponent Saubha makes himself invisible on the battlefield, shoots at him an arrow or missile that is guided by sound to hit its target. Vimanas are of many sorts and are described throughout the long and rich period of Indian ancient and medieval literature. In the Mahabharata their builders are said to be the yavanas, a western people that has been identified with the Greeks by many later sources but that probably refers to a large family of Western Indo-European nations or tribes. However, the minority religion of Jainism which is extremely ancient, has recorded that some of its Enlightened Guides (Tirthankaras) came to the world on jayanta Vimanas. In later texts some twenty-five shapes of Vimanas of diverse sizes, from the tiny to the gigantic (celestial cities) are described, some in fairly great details. In the language of architecture, a Vimana is a tower or building that has seven stories and is the specific name of the spire which arises above the sanctum (garbhabriha: house of the egg or germ) of a temple. More recent Samskrit treatises such as the Visnudharmottaram, the Aparajitaprachcha, the Abhilasirtharta Chintamani and the Narada and Kasyapa Silpa Sastras contain information on the construction and performance specifics of Vimanas. “Strong and durable must the body of the Vimana be made, like a great flying bird of light material. Inside one must put the mercury engine with its iron heating apparatus underneath. By means of the power latent in the mercury, which sets the driving whirlwind in motion, a man sitting inside may travel a great distance in the sky. The movements of a Vimana are such that it can vertically ascend, vertically descend, or move standing forwards or backwards. With the help of machines, human beings can fly through the air and heavenly beings can come down to earth”. From the aforesaid we can conclude that Indian sacred, historical and technical literature knows of many different worlds and dimensions and of several types of beings that generally move back and forth among those dimensions, just as we probably do unconsciously. Ancient India also kept the memory – perhaps refreshed by occasional or frequent observations – of artificially built spacecraft powered by psychic or mechanical energy, and capable of moving in the air as also on and beneath the water. We can now do a rapid review of relatively recent and contemporary reports which tally with the Indian legends, annals and chronicles and thus give reason to believe that these ancient accounts were based on real experience or at least on visual evidence. Even if we refrain from going back to the 19th century or to even older times where some reports (and even a few early photographs) of unknown aircraft and “non-human” creatures descended from the sky exist but for which hard proof may be lacking, we must recollect some significant statements, made by important figures of science and by military leader, indicating beyond reasonable doubt that an awareness of “higher beings” has existed for well over a century among the technocratic elite of our societies. It appears that for some unclear reason, a super-human, non-earthly or at least non-earthbound presence manifested itself to a number of people in both Europe and America shortly after the First World War. As if that great civilizational crisis, which marked the end of an era, had triggered intense interest “from above”. UFO sightings and even landings were reported in the USA and in Germany and some secret societies were formed, purportedly under the guidance of otherworldly beings. The most influential were the rumored but not historically established Black Sun and Vril Gesellschafts in Bavaria and the now well known Thule Group. The Vril Society, called after the cosmic energy of life that is equivalent to Prana in Samskrit, drew its inspiration from a young and beautiful Medium, Maria Orsic, who claimed to be in contact with a very advanced group of beings from a planet around the Aldebaran giant star (Rohini in Samskrit astronomy) within the Taurus constellation. Those beings allegedly sent her periodic messages and thereby conveyed high-level scientific information, designed to enable the members of the group to produce inexhaustible, non polluting energy and build aircraft capable of flying at virtually unlimited speed in order to reach the stars. The data channeled by Maria Orsic and other “Vrilerinnen” (young female mediums) were interpreted by Professor W. Schumann from the Technical University of Munich and used to try building the “flying saucers”, from a first unsuccessful prototype tried out as early as 1922 over a Bavarian lake. The program was later taken over by the Third Reich under the purview of its SS E-IV Division, as some members of the Vril and Thule groups (closed down by the Gestapo, as most other secret societies) became high-ranking officials of the new regime. Though much controversy surrounds the extent and rate of success of the “Haunebu” and “Vril ships” building program, there is no doubt that the Germans experimented throughout the war years with “flying disc” gyroscopic and turbojet technologies,- side by side with the more conventional V1 and V2 rockets built by Willy Ley and Wernher von Braun – through such craft as the RFZ-1, first tested in 1934, and the later and superior RFZ-2 which is believed to have achieved impressive performance levels. SS General Hans Kammler, who organized the use of prisoner labour from the concentration camps for the space weaponry program headed by General Dornberger, reportedly supervised the R&D effort into anti-gravity propulsion. 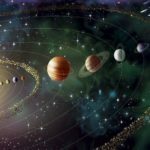 It is significant that the propulsion technology is said to have consisted essentially in the assembly of “Thule Tachyonators”, spheres of vertically rotating mercury, in line with what some of the Indian Shastras describe in the Vimanas. As Professor Hermann Oberth, one of the fathers of the German and later American space programs and the major mentor of von Braun, put it succinctly, they were helped by “people of other worlds”. In parallel with the German research effort, there is documentary proof that Benito Mussolini was briefed by his officials on the fall or landing of a UFO (an aeromobile sconosciuto: unknown aircraft) in the Veneto province of Italy in late 1932 and personally ordered the “leaden cast” of his own telegraphic instructions to be destroyed, as well as “total silence” to be kept, further instructing the state media to describe the object as a meteorite in their releases. Evidence for this is supplied in the form of facsimiles of the telegrams from the Dictator reproduced in the book “Contattismi di Massa” (2005) by Stefano Breccia (publish in English as “Mass Contacts” – Authorhouse, 2009). Mussolini – who soon afterwards created the Research Unit RS/33 dedicated to new technologies, with the participation of Guglielmo Marconi, the inventor of the Radio – would turn out to be one of many statesmen to be confronted with material evidence of this kind; and, like almost all others, he treated it as a top secret matter of national security. German ballistic and space-related research was obviously of utmost interest to the main victors of the war, the USA, the Soviet Union and Britain; and they took great pains to identify and “mop up” the evidence and equipment they found when they invaded the country. The American and Soviet space programs can be said to have arisen from the ashes of the Third Reich’s achievements and plans for winning the mastery of airspace and venturing out of the atmosphere. Skeptics have argued that the Vril is the name of a psycho-physical cosmic force first described in the 1871 novel “Vril – The Power of the Coming Race” by British writer and occultist Lord Bulwer Lytton, the famed author of the Last Days of Pompei; and that, being a fictional name could hardly have been adopted as a symbol and a goal by a German occult research society. However it must be noted that the Vril, the essential energy in light sound and electro-magnetism which Bulwer Lytton associates with a gigantic race of Indo-Aryan origin, living in a network of deep underground caverns and endowed with “Enochian knowledge”, was held to be real by eminent scholars of that period, not to mention other occultists like Helena P. Blavatsky and her theosophist colleagues. For one, the Indologist Louis Jacolliot who served as France’s Consul in Calcutta in the second half of the 19th century, mentioned the Vril as the invisible power tapped by the Jain initiates he met in Gujarat and Mysore and described in his book Traditions indo-europeennes (1876), proving that the name was used in a non-fictional context to account for real phenomena. Another reference to the Vril in an Indian context is found in the writings of Saint Yves d’Alveydre and I have personally heard testimonies from at least two persons, otherwise quite unaware of the above literature, who had heard from their relatives during the Second World War about secret weapons being developed by the German leadership and made possible by the discovery of Vril energy. Such contemporary accounts show at least that the stories had spread in German and Italian civil society and there may have been some fire behind that smoke. The German connection with an “Alien power” before and during World War II remains a matter of conjuncture and speculation until more documentation is found or made public. A puzzling statement was uttered by Reich Admiral Donitz during his trial at Nuremberg to the effect that the Reich had kept “an invisible fortification in the midst of the eternal ice”, interpreted by many as a hint of a remaining secret Nazi base near the South Pole. In this regard some intriguing clues can be retrieved from well established events. In late 1946, barely a year after the end of the War, when “ghost rockets” were being reported by the OSS (the precursor of the CIA) in Sweden, U.S. Secretary of Defense James Forrestal commissioned forOperation High Jump to Antarctica a large armada, consisting of two large vessels, amphibious command ship, USS Mount Olympus and the aircraft carrier USS Philippine Sea, 13 support ships, 2 seaplane tenders, 15 other aircraft, 6 helicopters et al. manned by 4700 men and commanded by the pioneer of polar exploration, Admiral Richard Byrd. The operation, surprisingly large and well armed for a “scientific” mission in an uninhabited part of the world was to last until the fall of 1947 but it was abruptly recalled in early March after apparently meeting with something unexpected and quite upsetting. A reported secret diary of Admiral Byrd, signed December 24th, 1956 surfaced several years after his demise on March 11th 1957. There has been so far no confirmation of its authenticity but some cryptic statements made by Byrd on his return journey from Antarctica, would seem to lend it some plausibility. “Admiral Byrd warned today of the necessity for the USA to adopt protective measures against the possibility of an invasion of the country by hostile aircraft proceeding from the polar regions”. “The most important of the observations and discoveries made was of the present political situation as it relates to the security of the USA” and he called for “the country to remain in a state of alert and watchfulness. We are abandoning the region after making important geographical discoveries”. Given that the U.S. was at the time the sole nuclear power – the USSR would spring a major surprise in August 1949 by detonating its own atom bomb – and the absolute winner of the recent global conflict while most of the world, including Western Europe, China, Japan and the USSR, lay in ruins or was still under colonial rule or American occupation, the warning given by Byrd is not easy to explain. The Soviet Union had already become the new enemy, but America could hardly fear the prospect of waves of Red Army bombers going all the way down to the South Pole on their way to North America and the Pentagon had more than enough means to repulse any “Bolshevik” air raid. In all probability, Byrd was referring to a clear and present danger that was not Soviet and which he could not publicly identify. 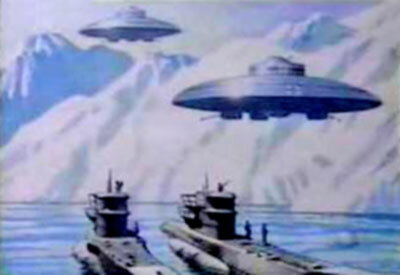 If we accept his secret diary as genuine, then we must believe that, according to his own words, as he flew over Antarctica from Base Camp “Little America IV” on Whales’s Bay, on the 2nd of February 1947 he was “intercepted” and escorted by “disc shaped craft” that took him to a sprawling underground facility, called “the domain of Arionni” where he met the leader of a mysterious Scandinavian-looking group of men, who spoke German-accented English and who warned him about the trials to be faced by mankind in future decades. Byrd further records in his diary that on his return to the USA, he submitted his secret account to Forrestal and was debriefed at the Pentagon for six and a half hours on March 11, 1947. That year which saw the independence of India and Pakistan, the creation of Israel and several other major international developments, was especially eventful on the “alien” front. It is well known that in June of that year, three months after Byrd’s return, many American newspapers carried the report of Aviator Kenneth Arnold about sighting a squadron of crescent shaped “flying wings” silently gliding “saucer-like” in the air over the State of Washington at 1200 nautical miles an hour. He was a highly credible and expert witness so that his testimony was unquestioned as there was no official policy yet to deny UFO reports. 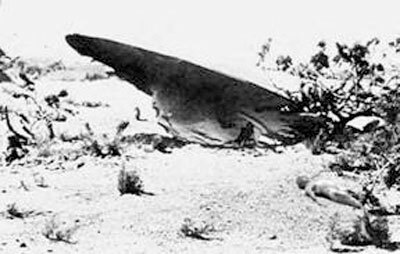 Between the 4th and the 6th of July, one or more craft, apparently crescent-shaped as well, crash landed or were brought down in the desert of New Mexico near Roswell in the general area of the Los Alamos, White Sands and Alamo Gordo (the nerve centre of the still ongoing Manhattan Project), as announced by the local army spokesmen, reported in the newspapers and on the radio, triggering a flurry of activity within the U.S. Government which promptly ordered the concerned military authorities to issue retractions and rushed by Executive Order the passage of a draconian and secretive National Security Act in the fall of that year. Whether coincidentally or not, Forrestal’s 3000 page day to day journal skips the period between July 3rd and 14th completely. Subsequent UFO alerts and “crashes” were thence dealt with the same mixture of barely concealed alarm and stringent censorship. In September, the Strategic Air Command sent a wing of B-29 bombers on a mission to the Arctic, basing them at Fort Richardson, Alaska, possibly in response to Admiral Byrd’s cautionary warning about the danger of attack from the poles. Like the records of Operation High Jump, the goals and findings of that mission were classified. Less than two years later, the circumstances of Forrestal’s mental breakdown and subsequent death by suicide in circumstances that were never properly investigated, while under 24 hour watch at the Bethesda Naval Hospital, provide support for theories about a major and ominous secret that may have been suspected by the American leadership during the War and at least partly discovered by Byrd during the High Jump Antarctic mission. That secret has been kept since by certain persons and agencies in the U.S. government, if we judge by the amount of indicative evidence available in public records. It has been established by his biographers that the ex-Secretary of Defense was under heavy stress on 28th March 1949, when President Truman made him tender his resignation, at which time the Secretary of the Air Force, Stuart Symington told him in confidence something which seems to have pushed him “off the edge”. The very next day Forrestal was flown to the house of future Defense Secretary Robert Lovett in Florida under military supervision, placed under the care of a Navy psychiatrist who heavily medicated him, and then checked into Bethesda on April 2nd as an in-patient; his journal was removed to the White House on Truman’s order. Richard Dolan, in his detailed chapter on Forrestal’s death included in his book “UFOs and The National Security State – Part I”, notes that very few people were allowed to meet with him (his brother Henry had to ask many times before being allowed to visit) and that even his own religious confessors were inexplicably kept away by the Navy minders who supervised his care (Forrestal was a practicing Roman Catholic). On the other hand, Truman, his successor at the Department of Defense, Louis Johnson, his old foe Stuart Symington and a few other high government officials called on him though he had not requested to see them. Truman was demonstrably worried about any undiscovered papers or recordings that might have been kept by his former cabinet member and in August of 1949, Louis Johnson sent him a confidential memo to reassure him that no voice recordings or any other documents concerning Truman’s conversation with Forrestal remained. Effectively, Forrestal had become a prisoner of the U.S. Navy. It appears that the government’s concern was to prevent disclosures by the former cabinet member who ended his own life (or was made to) on May 22, 1949, in the night before his brother was to take him home following his apparent recovery. Incidentally one of Air Force Secretary Stuart Symington’s cousins is no other than Fife Symington who, while Governor of Arizona, on March 13th 1997 was one of the thousands of baffled witnesses to the spectacular “Phoenix Lights”, described as the passage of a silent 2000 to 3000 feet wide delta-shaped matte black craft sporting a row of dazzling headlights, over the city. After attempting to ridicule the sighting at a press conference by getting one of his staff to wear an “Alien grey” mask, Symington years later, when out of office apologized and readily acknowledged on camera at the Washington DC National Press Club that what he had seen was indeed “some form of an alien spacecraft”. The “ET factor” does seem to run across generations for some families. There are of course many matters on which Forrestal must have had very privileged information that might have caused distress to Truman if he had spoken out, but an intriguing clue was provided by General Arthur Exon, the former commanding officer of the Wright Patterson Air Base (the site of Air Materiel Command) in 1990 when he stated that Stuart Symington had been a member of “Unholy 13” who controlled policy on UFO-related matters in the Government. That group is almost certainly the “above top secret” MJ-12 or Majestic Committee, reportedly appointed by Truman and Forrestal to manage the alien situation, on which Forrestal sat. An exhaustive collection of the solid and confirmed reports of Alien sightings and encounters compiled since 1947 to this day would fill many books (which have already been written) and so we can only briefly mention a few of the most unquestionable records. It is important to point out, as we noted earlier, that since the second half of World War, the U.S. had embarked not only on the top-secret, exorbitantly expensive Manhattan Project (the Oak Ridge Laboratory alone consumed one sixth of all the electrical power produced in the country during the War years) but also on an elaborate program to gain possession of all the advanced research and technology to be found in the Third Reich, through the JIOA (Joint Intelligence Objectives Agency). Hundreds of “Nazi” scientists and engineers were identified and singled out for transfer to the USA in the belief that they could make an invaluable contribution to the American war machine as well as to its civilian economy. No less than 86 aeronautical engineers and 127 rocket scientists, among them von Braun, and his boss Dornberger, were targeted by Operation Lusty (Luftwaffe Secret Technology) out of a total of some 1600 men. From 1945 on, most were brought to the USA after being secretly detained, often in violation of the Geneva convention since the Red Cross was kept in the dark about their locations. Furthermore, in order to circumvent a U.S. legislation prohibiting asylum to those connected directly to the Nazi regime, those who could be held accountable for war crimes were provided with false records by the OSS. The high priority operation known first as Overcast and later as Paperclip reflects the hypocrisy or at least the moral ambiguity of an all powerful military complex which blithely ignored national and international laws in order to achieve its goals, following in the footsteps of the Manhattan Project, coordinated by Dr. Vannevar Bush, the founder and head of the secretive Office of Scientific Research and Development(OSRD). Bush is also believed to have set up and headed MJ-12, which according to classified correspondence of the time was kept at a higher level of secrecy than its now famous atom-bomb making predecessor. The Lusty Operation acquired and stored at its Air Materiel Command Headquarters at Wright Field, Ohio (later Wright Patterson AFB) more than 16000 items, weighing 6200 tons, of blacklisted “foreign equipment” from the Axis powers, most of it related to aeronautics and ballistics. Since there was no independent U.S. Air Force as yet, the supervising authority was the Army’s “Foreign technology Desk” at the Pentagon. 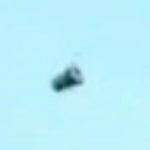 The late Colonel Philip J Corso, a high-level military intelligence officer, has affirmed in his memoirs that said desk also received and held some “alien technology” recovered aboard the captured flying discs. There is no escaping the conclusion that a hegemonic but paranoid United States, in the wake of the greatest war of the 20th century, quickly geared for a new confrontation, not only with the Communist powers in Russia and then in China, but also with a seemingly non-human off world agency, first believed to originate at or under the poles, which it defined as a secret but major threat. President Truman, extensively briefed on the UFO sightings and encounters by his military Liaison officer Colonel Robert Landry, must, like all officials in the know, have been unnerved by the frequent visits of “unknown intelligent aircraft” to the most sensitive and restricted strategic facilities of the country, including the White Sands and Alamo Gordo installations. “I can assure you that flying saucers, given that they exists are not constructed by any power of on this Earth”. The following years were to witness thousands of sightings and several spectacular UFO overflights of many of the world’s capitals, particularly over Washington DC as also over the Air Force bases and nuclear power plants of the USA and of the other great powers. In 1952, shortly after the massive passages over the White House and the Pentagon by UFOs on January 19th, the President had General Hoyt Sanford Vandenberg, the Air Force Chief of Staff tell that it had been confirmed that they were neither Russian nor American and that the government did not know their identity or origin. However Vandenberg, a former director of Central Intelligence, had been directly associated with the official handling of the Roswell incident in 1947 and is listed as a member of Majestic 12. In 1948, he had partly dismissed, without giving his reasons but seemingly on grounds of national security, the “Estimate of the Situation” appended to his own USAF staff’s Project Sign report on UFOs, favoring an Extra-terrestrial origin. The report was subsequently burnt on his orders in 1950. The evidence of an attempt at a cover up appears overwhelming. It is worth noting that the personal papers of the General are kept at the National Archives where they are classified (inaccessible to the public). He thus arguably knew more than he publicly declared in 1952 about the nature of the flying vehicles that had buzzed the federal capital. Other superior officers were more outspoken as shown by General George Ramey, deputy chief of AF staff for operations, on July 29, 1952 when he gave a press conference in which, according to the San Francisco Examiner, he stated: Jets have been placed on 24 hour nationwide alert against flying saucers with orders to shoot them down if they refuse to land. 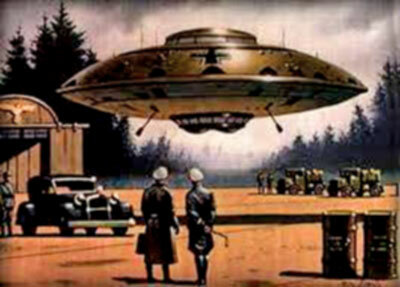 We take them seriously (flying saucers) when you consider we have lost many men and planes trying to intercept them. In Europe and on the other side of the iron curtain, Soviet top military officers were making similar comments though those were usually censored or downplayed in the state media. “We find ourselves faced by powers which are far stronger than hitherto assumed, and whose base is at present unknown to us. More I cannot say at present. We are now engaged in entering into closer contact with these powers, and within six or nine months it may be possible to speak with more precision on the matter”. Von Braun seems to have approached the UFO mystery with an open mind and a rather optimistic disposition; but such was not the mindset of the Generals and civilian officials who ran the Pentagon and the Intelligence Agencies. They obviously saw potential enemies in the unknown visitors and called for mental and technical mobilization at the highest levels of government against what they perceived as a formidable threat. Statements on record from top men in uniform such as Nathan Twining, Benjamin Childlaw and Douglas MacArthur attest to that. “ultimate conflict between a united human race and the sinister forces of another planetary galaxy”. Already then, perhaps from the time of the Mars invasion broadcast by Orson Welles in October 1938, the UFO-ET phenomenon had become part of popular culture through innumerable books, radio programs, films and television series. The information has spread around ever more widely, though it is surrounded by an equally large amount of misinformation, generating a climate of general confusion. In recent years, classified documents released by the governments of several countries, including the Defence Ministries of Britain, France, Brazil, Peru and Mexico, have once and for all provided hard evidence for the existence of Alien beings piloting very advanced flying craft and landing on earth. One of the reports released by the MOD of the UK in July 2010 indicates that Prime Minister Winston Churchill had agreed with General Eisenhower to cover up close encounters between military Planes and UFOs during the War, in the interest of national security and social stability. Revealingly, Churchill was concerned that religion might be fatally harmed as a result of public disclosure of those incidents. However, side by side with the technological and military developments connected with the official reaction to the UFO phenomenon, there was a less visible spiritual effect. 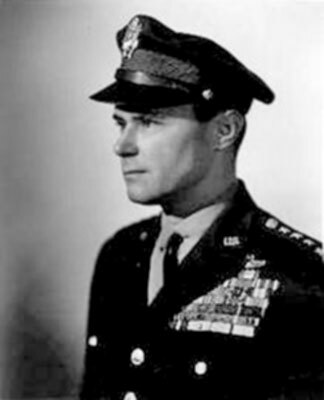 General Dornberger occupied a high position at the Bell Aerospace Corporation, in which was associated with Arthur M Young, the visionary engineer and inventor who founded the Institute for the Study of Consciousness. 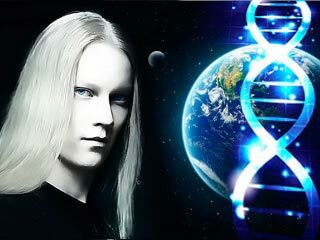 Young and researcher Andrija Puharich were both members of the Round Table Foundation, at Glen Cove, Maine, which acted as a “channel” for a series of messages reportedly sent by an assembly of Extra-terrestrial authorities designated as the Council of Nine, through a visiting Indian medium, the respected Indian spiritual teacher and clairvoyant Maharshi Nyayaratna DG Vinod from Mumbai, known to many of the leading figures of India at the time of the Independence, including Mahatma Gandhi, Sri Aurobindo and Rabindranath Tagore and who had been invited to the USA by the University of Duke. The Nine were said to have inspired Gene Roddenberry to create his immensely successful Star Trek television series. Vinod achieved great fame in the world of ESP research as he lectured and collaborated with several universities and specialized institutes in the USA (such as Dr. Pfeiffer’s parapsychological research center in Spring Valley, NY) and Europe. He met figures of the caliber of Jung, Aldous Huxley, Eistein and Millikan. The Round Table Foundation was supported by the prestigious Stanford Research Institute (SRI), whose director was then Dr. Harold Puthoff, a pioneer in para-normal and UFO-related studies. A related organization was the Jason Institute which focused on defence-related matters and was thereby related to the CIA whose various, and generally infamous, programs to investigate and test the potential for mind warfare and related clandestine operations, such as MK Ultra and Artichoke, bear a relation to the observation and investigation of UFOs, as recognized by the well known researcher H.P.Albarelli, founding member of the North American Truth and Accountability Commission on Human Experimentation and author of A Terrible Mistake: the Murder of Frank Olson and the CIA’s Secret Cold War Experiments(2010), though the exact nature of the link is often difficult to assess. There seems to be a form of cooperation between some “Aliens” and those U.S. agencies unless the latter are simply trying to use the information they gather from those beings. Similar hints can be gleaned from other governments at one time or another. For example, the President of the Russian Buddhist Republic of Kalmykia, Kirsan Ilyumzhinov declared in 2010 on a prime time show on Russian Television that he had been abducted in 1997 from his Moscow home by “Alien yellow-clad cosmonauts” aboard a spaceship and told that they were “not ready” to publicly interact with mankind. This statement triggered an official letter from a deputy from the Duma, the Russian Parliament, to President Dimitri Medvedev seeking a clarification on the significance of this testimony and its implications for national security. However no response from the Russian head of state seems to have been forthcoming so far and his silence may be another evidence of the deep quandary that many states find themselves in. In 2009, the wife of Japanese then-Prime Minister Hatoyama reiterated to the Media that she had been “taken to Venus” on a UFO. One of the most puzzling but spiritually and aesthetically pleasing phenomena generally regarded as a corollary of the presence of UFOs is the frequent appearance of the “crop circles” in various parts of the world, but more often in England. The extraordinary complexity of those geometric patterns whose shapes and designs closely resemble the Indian yantras and mandalas denotes not only an unknown and very sophisticated technology – seemingly using microwave beams – to produce them, generally in the dead of the night and in a matter of seconds, with no visible agent being present (except for some rapidly moving lights which disappear as suddenly as they manifest) but also a deep familiarity with the sacred geometry of the ancient world and with advanced mathematics and bio-physical laws. It has been demonstrated by various scholars in the subject that those “circles” sometimes contain elaborate scientific formulations and reveal new equations and physical laws. Attempts by professional skeptics to “debunk” the mystery by getting pranksters to draw some of the relatively cruder patterns on fields with the help of ropes and other primitive tools, belong to the systematic policy of denying the “para-normal” reality altogether, dismissing evidence by means of flimsy pseudo-explanations. 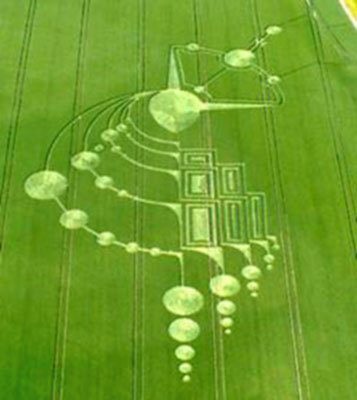 They don’t change anything to the reality of the crop circle phenomenon, no matter what many people, unfamiliar with the facts, have been led to believe. NASA photographs taken in outer space have been interpreted by some experts to show some gigantic artificial objects that appear to be the “massive spaceships” alluded to by astrophysicist Stephen Hawkingin a recent TV documentary on cosmology and the flying cities and celestial lokas described in some ancient Indian texts. Even more amazing are some genuine, unretouched or photoshopped pictures showing UFOs, sometimes of a very large size, as being almost invisible or transparent, as if they moved on the fringe of our physical universe or at least on the edge of electromagnetic perception. They would hence appear to belong to the other dimensions often described in ancient texts as also by contemporary “occultist” writers. It is therefore much easier to understand why that facet of reality has generally been discounted or ignored by mainstream scientific research. “It remains an established fact, supported by numerous observations, that UFOs have not only been seen visually but have also been picked up on the radar screen and have left traces on the photographic plate. It boils down to nothing less than this: that either psychic projections throw back a radar echo, or else the appearance of real objects affords an opportunity for mythological projections”. Then, are Indian mythology and ancient history (Itihasa: “so it was”), among others that have come down from the remote past on most continents, records of an era when human beings acknowledged the presence of gods or “shining ones” hailing from various “heavens” and dimensions, and interacted with them on many levels? If so, our modern “scientific worldview” is in need of drastic review and correction and the history of our origins could be very different from what we are taught in schools.